In March 1997, the Newport Saint Patrick’s Day Parade was rerouted so that a group of Mende tribesmen could be tried for murder in the Colony House. However, parade music was still audible inside the courtroom, and the filming of Stephen Spielberg’s Amistad had to be postponed until the afternoon. Amistad is based on the 1839 story of Sierra Leone tribesmen, kidnapped as slaves, who staged a mutiny. The mutineers ordered the crew to return them to Africa, but the navigator instead sailed to New England. Importing slaves had been illegal since 1808, but since the Mende couldn’t talk with their captors, authorities presumed them to be American-born runaway slaves. The Mende were arrested and tried for murder in New Haven, Connecticut. While imprisoned, they taught a Yale linguist, Josiah Willard Gibbs, how to count to ten in Mende. Gibbs walked along the docks counting until a Mende sailor looked up. With the sailor serving as a translator, the men told their story and were set free. In Amistad, Newport’s Washington Square stands in for the New Haven Green, with Colony House serving as the courthouse. Djimon Hounsou starred as Cinque, leader of the Mende, and Anthony Hopkins played an astute John Quincy Adams. Matthew McConaughey played the Mende’s lawyer, Roger Sherman Baldwin; Stellan Skarsgård was Lewis Tappan, an abolitionist who supported the Mende; and Morgan Freeman was cast as fictional abolitionist Theodore Joadson. 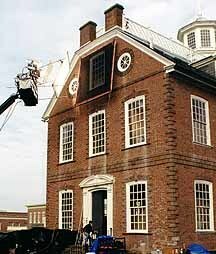 The film crew used the first floor of the Colony House for staging, while the second and third floors became the court. Secondary locations included Queen Anne Square and Saint John’s Episcopal Church in Newport’s Point neighborhood. During filming, McConaughey was often spotted at Newport’s bars. The film encountered modern-day challenges beyond parades. Heavy wind turned the dirt used to cover modern asphalt roads into billowing clouds. The barely clothed actors portraying the Africans suffered in the cold. They covered themselves with blankets between takes although Spielberg reportedly wanted them to look genuinely cold. Newport’s changing weather posed a lighting issue for interior scenes. To handle fluctuations, the film crew mounted giant, adjustable screens on the outside of the building. 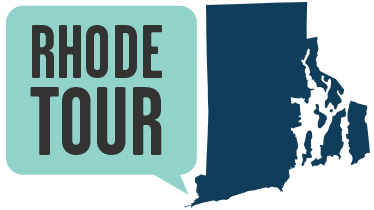 Visitors can still tour the Colony House, now operated by the Newport Historical Society. Though not the site of the actual Amistad trial, the Colony House has served many purposes since its construction in 1736. 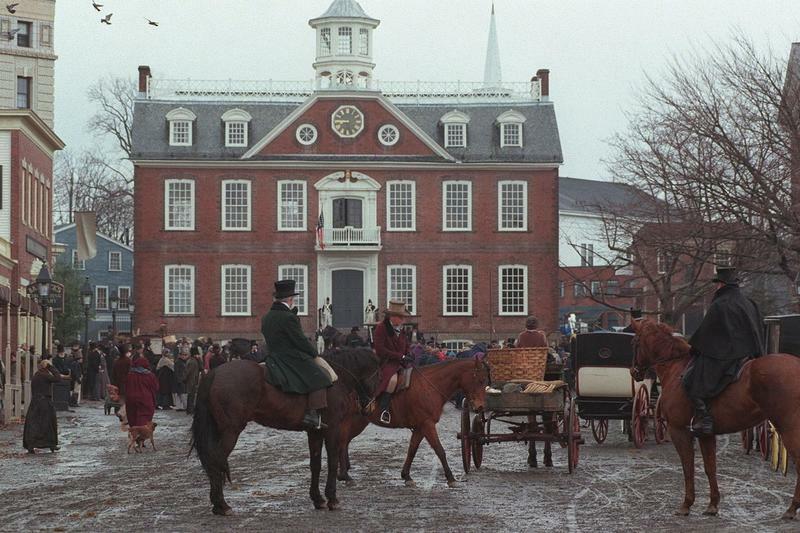 The Declaration of Independence was read on its steps, the British Army resided in the building during the Revolutionary War, and it served as the statehouse of Rhode Island until 1901. Be sure to visit the Colony House when you're in Newport. For hours and information, contact the Newport Historical Society or visit their website at newporthistory.org. If you travel north to Providence, you will encounter yet another scene from the film: Spielberg used the current state capitol building as a stand-in for the United States Capitol. Jeremy Wolin, “The Newport Colony House and Amistad,” Rhode Tour, accessed April 21, 2019, http://rhodetour.org/items/show/162. Joe Baker, “Mysteries Abound: Tour reveals secrets behind Newport's historic Colony House,” The Newport Daily News, June 27, 2014. Available online at http://www.newportri.com/newportdailynews/news/page_one/mysteries-abound/article_a7ae452b-9dd1-5cdc-bd60-76cdb8596074.html. “Colony House,” Newport Historical Society. Available online at http://newporthistory.org/properties/colony-house/. Vic Farmer, "The Amistad Set, Newport, RI 1997,” Web Ghosts. Available online at http://www.webghosts.com/amistad/. 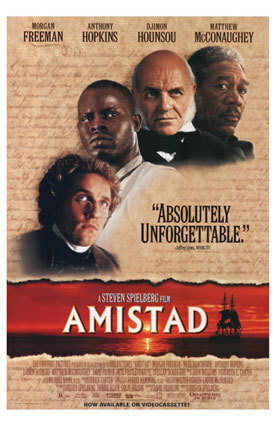 Amistad (film), Wikipedia entry. Available online at https://en.wikipedia.org/wiki/Amistad_(film). The Amistad Case, National Archives. Available online at https://www.archives.gov/education/lessons/amistad.